I apologize for having such a long gap in between nail polish posts. Between school being out and getting a new camera that I have no clue how to use, I just can't find a few minutes to sit down and blog. I can write posts, but it's the picture taking, editing, and posting is what takes forever. And as my free time is in short supply right now, my blogging is suffering. I hope to get restarted within the next few days. As soon as I can figure out how to take good macro pics on my camera. Ugh. Many Americans consider giving blood to be an important act of community service, however, less than 10 percent donate on an annual basis. Incredibly, if just one percent more donated–less than four million Americans–the nation’s blood shortages would disappear for the foreseeable future. To help close this gap, Nexcare Brand and America’s Blood Centers are partnering on the second annual give program, a nationwide blood donation initiative kicking off on World Blood Donor Day, Monday, June 14th, and extending through Sunday, June 20th. 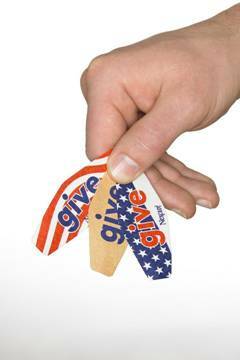 With the support of hundreds of participating local blood centers, the give program inspires Americans with a message of hope, and helps them to spread the word by distributing limited-edition Nexcare Bandages marked with the word give. World Blood Donor Day comes at an important time each year. As local blood centers face “summer shortages,” the nation’s blood supply comes under strain due to less donations because of increased vacation schedules and other seasonal distractions that tend to take place in the summer months. World Blood Donor Day reminds Americans to donate and enables them to help make a impact in reducing these shortages. The 2010 give Bandages are inspired by both the patriotic act of giving blood as well as Flag Day, which will also be recognized on June 14, 2010. This collection of three Nexcare bandages are designed to represent the American flag signify the everyday hero in each American who commits to saving lives by donating blood. Additionally, there’s a dedicated website, http://www.nexcaregive.com/, where visitors can share their story, get directions to our local blood center and register to receive coupons and a free sampling of bandages. This press release reminded me that I've never actually given blood, though I cetainly have meant to at various points in my life. Last year, my father was admitted to the hospital. He was septic and ended up having to have his right leg amputated at the knee. He's fine now, but during the month he was in the hospital, he had to receive blood at least a couple of times. For this reason, as well as others, I feel compelled to donate. Unfortunately, I will be unable to donate on June 14th, but I do plan on donating in the fall when my schedule clears up. I hope this encourages you to go to your local center and donate, whether it be on June 14th of at another time.